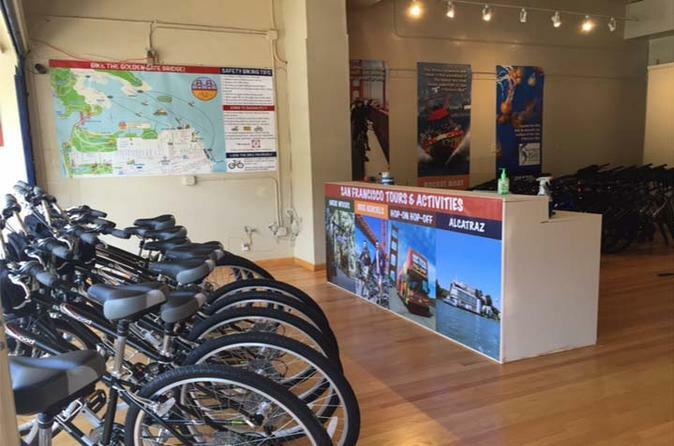 Rent a bike at the bicycle rental shop nearest to the Golden Gate Bridge in San Francisco. Bike along waterfront paths and across the Golden Gate Bridge to Sausalito, where you can return by ferry (ticket is your own expense). A helmet, lock, and map are all included with your rental. Pick up your bike, helmet, lock, and a map at the rental shop in the Marina District of San Francisco, located within 3 miles (4.8 km) of the Palace of Fine Arts, Crissy Field, Fort Point, and the Golden Gate Bridge — reached via a scenic bike trail alongside the Marina Green. You can ride north all the way across the bridge and snap photos at Vista Point, then continue downhill into Sausalito, a waterfront town with many shopping and dining opportunities. To make your trip easier, return by ferry from Sausalito to Fisherman's Wharf; you can purchase your ticket directly at the ferry terminal. The entire self-guided bike tour typically takes between 3 and 4 hours.